Fragrant plants bring a delightful dimension to the garden. There's a scented plant for every nose. 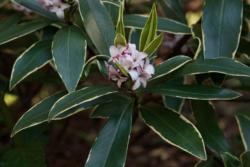 Some, like the winter-blooming Daphne odora, emit a powerful perfume that carries quite a distance. Others, like the Mexican orange (Choisya ternata) require a close-up sniff. Citrus, jasmine, lavender, lilac, wisteria and many rose varieties are favorites among fragrance lovers, but here are some lesser known choices. The Kool-Aid bush (Psoralea pinnata) is a showstopper during its summer bloom period. 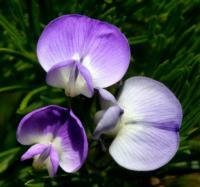 Covered in bi-color lavender and white sweet pea-like flowers, it reminds some people of grape Kool-Aid. It is fast growing and drought tolerant. Lily-of-the valley tree (Clethra arborea) bears upright clusters of white flowers resembling their namesake in form and scent. The smaller, deciduous Clethra alnifolia, or sweet pepperbush, carries spires of tiny white flowers with a spicy aroma. The California native spice bush (Calycanthus occidentalis) has dark red flowers shaped like small waterlilies, with the scent of wine. The evergreen Michelia has profuse, fragrant magnolia-like blossoms. Choose from species of varying sizes. Michelia figo is good patio shrub, its fruity fragrance evoking the smell of ripe bananas. Angel's trumpet (Brugmansia) likes a sheltered spot where visitors can admire its huge tubular flowers that are especially fragrant in the evening. Butterfly bush (Buddleja) is a butterfly magnet, as its name suggests. Try Buddleja asiatica for a freesia-like perfume. In areas where frost is not a problem, try paper bush (Edgeworthia chrysantha). This is a relative of daphne, with fragrant pale yellow flowers. Edgeworthia gardneri, an evergreen shrub from Nepal, has waxy golden pompom flowers the size of pingpong balls. Bush anemone (Carpenteria californica) is a versatile, low-water shrub with scented white flowers. Another choice for white blooms is mock orange (Philadelphus), but buy it when in bloom during late spring or early summer to check for fragrance. A useful shrub for shady areas near entryways is sweet box (Sarcococca), which blooms in late winter or early spring with small, fragrant white flowers. Chaste tree (Vitex agnus-castus), which can be trained as an attractive small shade tree, has both aromatic leaves and fragrant lavender-blue flowers. Pink and white-flowered varieties also are available. Some species of viburnum offer heady scents. Among the notable varieties are fragrant snowball (Viburnum carlcephalum) and Korean spice viburnum (Viburnum carlesii). Chocolate lovers will adore the scent of chocolate cosmos (Cosmos atrosanguineus), along with its stunning dark red blossoms. For fans of Thin Mint Girl Scout cookies, there's a chocolate-scented mint (there are apple and pineapple-scented mints, too). Grow them in pots or boxes to control their rampant spread. Stock (Matthiola), an old-fashioned cutting flower, is often grown as an annual. Other annuals include heliotrope (Heliotropium arborescens), English wallflower (Erysimum cheiri), some dianthus (think carnations and pinks), sweet pea (Lathyrus odoratus), nicotiana and mignonette (Reseda odorata). For sweet-smelling ground covers, consider cheddar pink (Dianthus gratianopolitanus), the musky Geranium macrorrhizum and sweet violet (Viola odorata) -- but beware its spreading habit. Gardeners who appreciate the aromatic scents of foliage gravitate toward lavender, rosemary, thyme, oregano, hyssop (Agastache) and germander (Teuchrium chamaedrys). Many of the sages are notable for their scented foliage (Salvia spathacea -- fruity, Salvia elegans -- pineapple, Salvia melissodora --grape). On top of their aromas, these plants have the bonus of attracting pollinators and beneficial insects. They tend to be deer-resistant as well. Evergreen clematis (Clematis armandii) will astonish you with its curtain of fragrant white spring blossoms, glossy dark-green foliage and rapid growth once established. Equally floriferous in fall is the deciduous sweet autumn clematis (Clematis terniflora). Chilean jasmine (Mandevilla laxa) has gardenia-scented white flowers in summer. 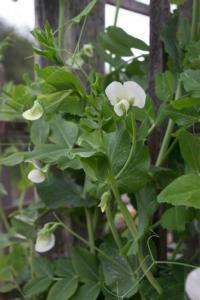 It is an evergreen vine, growing to 15 feet or more in frost-free areas. Passion vine (Passiflora incense) has 5-inch wide purple flowers with a sweet pea-like scent. This deciduous vine offers the bonus of tasty, fragrant fruit. Vanilla trumpet vine (Distictis laxiflora) shows off its ample clusters of violet blooms for up to eight months. The vanilla-scented flowers fade to lavender and white. It requires less pruning than most trumpet vines. Don't forget the many types of bulbs that deliver their sweet perfumes in spring or summer: Browse mail-order bulb catalogs to find fragrant varieties of narcissus and daffodils, like Narcissus 'White Lion' or Thalia; the smaller jonquilla hybrids, and the clustering Tazetta hybrids. Search out Crocus chrysanthus and the many fragrant choices among bearded iris, hyacinths, freesia and lilies. Tuberose (Polianthus tuberosa) has a heady perfume. You'll find many other scented plants in the Sunset Western Garden Book and simply by following your nose on your daily rounds.